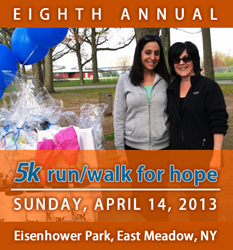 Hundreds of New Yorkers are expected to gather for the 8th Annual 5K Walk/Run for Hope on April 14, 2013, at 10am in Eisenhower Park (Field 4, Scarlet Oak) in East Meadow, Long Island, NY. Money raised at the event will directly support the Mesothelioma Applied Research Foundation, a non-profit organization that funds research for the treatment and eventual cure for mesothelioma, an extremely rare cancer causes by exposure to asbestos. Join the mesothelioma lawyers from Levy Phillips & Konigsberg LLP (“LPK”) as they proudly support and participate in the upcoming New York 5K Walk/Run for Hope, scheduled for April 14, 2013 at 10am in Eisenhower Park (Field 4, Scarlet Oak), East Meadow, NY. As always, all proceeds will go to the Mesothelioma Applied Research Foundation (Meso Foundation), a 501 (c) (3) organization that has awarded $8.24 million in grants for mesothelioma research since its inception in 2000. Mesothelioma is an extremely rare cancer caused by exposure to asbestos. Its most common form affects the lungs (pleural mesothelioma); however it has also been found invading the lining of the abdomen (peritoneal mesothelioma). In the United States, about 3,000 patients are diagnosed with mesothelioma annually, yet the disease has yet to get a national spotlight for research and funding. This aggressive, incurable cancer continues to be a threat to men and women across our nation. Due to the long latency of the disease, most people are not aware of the hazard that was caused by asbestos exposure until some 20-40 years after the exposure took place. Additionally, with the horrific events that transpired in New York City on September 11, 2001, we continue to see the devastation of asbestos exposure exhibited in patients diagnosed with asbestos-related diseases, including mesothelioma, lung cancer, and asbestosis. Families, advocates, physicians, and researchers have joined the Meso Foundation for a common goal, concentrated on eradicating the vicious, often lethal, effects of mesothelioma. Two Long Island women, Erica Iacono and Janice Malkotsis, have made it their life’s mission to work together to raise awareness and funds for the Foundation - more than $150K over the past seven years. The women have teamed up to turn their personal family tragedies into a positive future for those who suffer from mesothelioma. Erica’s father, Anthony Iacono, a NYC school teacher, was diagnosed with pleural mesothelioma in March 2000 and died just seven weeks later. Janice’s father, Joseph Lombardo, a construction and glass worker, was diagnosed with peritoneal mesothelioma in 2003 and passed away less than two years later. Since then, both Erica and Janice have dedicated their lives to bring hope to other patients and families by raising money for research that can discover new treatments - and one day, a cure. Registration for 5K Walk/Run for Hope is $30. LPK invites those who wish to register on the date of the event to arrive by 9:00 am. For additional information, please visit http://www.curemeso.org.